Order a book or CD from Amazon, and it is shipped within 24 hours. Behind the scenes, getting the items from a warehouse to a home is part of a complex, but well-integrated distribution process. 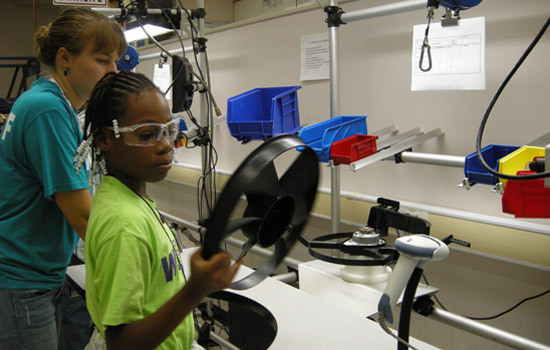 A new educational program is being developed at Rochester Institute of Technology that could help younger students understand this engineering process and introduce them to the variety of professions needing the skills of engineers and scientists. The Toyota USA Foundation has awarded RIT’s Kate Gleason College of Engineering a three-year $420,000 grant to develop the Relevant Education in Math and Science Program. The program targets students in the 5th to 12th grades, uses real-world engineering, math and science problems, and it will eventually incorporate an online component to reach beyond its initial offering to students from schools in Rochester and the surrounding areas. “Through hands-on lab activities and age-appropriate, interactive learning modules, students will use math and science skills to examine three pressing real-world problems facing the United States today: preserving sustainable, competitive manufacturing, developing and delivering efficient health care services and distributing products and services across the world,” says Jacqueline Mozrall, associate dean of the Kate Gleason College of Engineering and the grant’s executive director. Two engineering faculty, Margaret Bailey and Andres Carrano, will lead the team developing 33 classroom modules. Each module will be linked to math and science theory that students currently learn in school, but applied using specific, understandable examples. Bailey is an engineering professor and director of the Women in Engineering program, WE@RIT. Carrano is associate professor of industrial and systems engineering and director of the Toyota Production Systems Lab. The team will consist of engineering faculty and staff as well as area middle- and high school teachers. 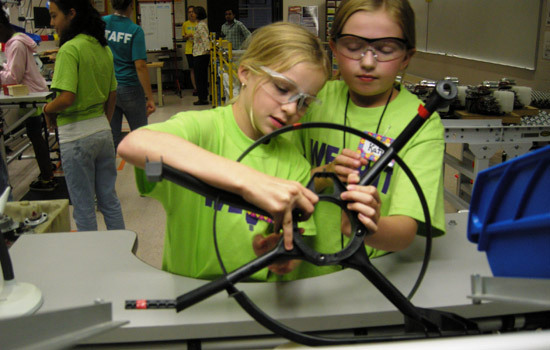 The Relevant Education in Math and Science Program grew out of a collaborative effort between the Toyota Production Systems Lab and the Women in Engineering Program, WE@RIT, both part of the engineering college, Mozrall explains. The Toyota Lab features a reconfigurable production line similar to ones found in the manufacturing industry. The lab is widely used for undergraduate and graduate courses in the college, and is also featured during outreach activities conducted by WE@RIT. More than 2,000 girls and young women in 4th–12th grade participate in these programs annually. The new Relevant Education in Math and Science Program will serve Rochester-area public schools with enhanced on-campus laboratory experiences in its first year, and then expand to a national audience of teachers and students via online learning modules within the second and third year. An advisory board is also being developed and will include representation from the college, local school districts and related industry partners. The Toyota USA Foundation is a $100 million charitable endowment created to support education programs serving kindergarten through 12th grade students and their teachers in the United States, with an emphasis on mathematics, science and environmental science. For additional information about the Toyota USA Foundation, visit www.toyota.com/foundation or contact Javier Moreno, Toyota, 212-715-7469 or jmoreno@tma.toyota.com.